GOGO Music is extremely delighted to present the first single from Ralf GUM’s forthcoming album, “In My City”. It features Seattle-based soul sensation Portia Monique and is titled “Free (Is All I Wanna Be)”. After the huge success of Ralf GUM’s 2012 long-player, “Never Leaves You” (which was gold-awarded in South Africa and the best selling album of the year on Traxsource), this song will certainly increase the anticipation for GUM’s full-length. Ralf GUM needs no introduction to House music lovers. Well known as a purveyor of all things soulful for more than two decades, his career has risen steadily since he put out his first tracks in the early nineties. Ralf has released countless songs that are considered classics nowadays, but his insatiable curiosity to enhance the four-to-the-floor House formula is still as strong as ever. 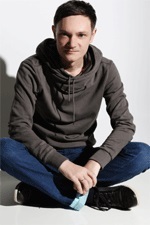 In 2008, Ralf GUM released his long-awaited debut LP “Uniting Music” to plaudits; the UK’s M8 Magazine called the CD “simply one of the best albums of the year”. It was followed by his second long-player, “Never Leaves You”, in 2012, which was likewise celebrated. It included a variety of hit singles, among them “Take Me To My Love”, an official South African number one. Blues and Soul Magazine wrote that it was “an impressive, truly soulful collection of songs… emphatically demonstrating Ralf GUM’s ability to orchestrate soul-house goodness on the grandest possible scale,” while Tilllate Magazine said it was “simply amazing - now go buy it and support he finest soulful vocal house.” In 2014 Ralf GUM will release his third full-length and “Free (Is All I Wanna Be)” provides a sweet foretaste. The single features Portia Monique, a lady who was born to sing. As a three-year-old she was performing in the mirror; by seven she was singing in church; and by nine she was writing snappy lyrics to further hone her talent. In her teens, musical studies followed, and through this she made an increasingly impactful series of hook-ups with various artists and producers. Portia’s beautifully unique voice blends hip-hop bite with velvety soul via dazzlingly complex harmonies, snazzy, jazzy tricks and some seriously insightful lyrical craft. This has brought her to the attention of kingpin US producers like Rodney Jerkins (Whitney Houston, Michael Jackson, Mary J Blige), Kyle West (LL Cool J) and Midi Mafia (Brandy, Talib Kweli, Frank Ocean). Additionally across the pond she’s caught the ear of Reel People Music’s Oli Lazarus, which has opened her up to a brand new avenue of opportunity, which she has gloriously exploited. All of which bodes well for 2014, when Ms. Monique’s debut album finally lands. Her collaboration with Ralf GUM shows why she’s considered a real star on the rise. With this single release, GOGO Music manages to pair deliciously soulful vocals from Portia Monique with a deep creative production by Ralf GUM and Phil Kullmann - “Free (Is All I Wanna Be)” is a song that should not be missed by real House music DJs and good music lovers. For just about as long as I’ve been writing music reviews, Ralf GUM and his GOGO Music label have been delivering stunning tunes designed to move your soul as well as your feet. “Free” is another sweet, soothing track with gentle yet compelling tribal rhythms and gorgeous vocals. The music just oozes emotion with Portia’s distinctive voice complimenting Ralf’s arrangement perfectly. Essential! :: 'Ralf GUM is always on time with his productions! Great summer feeling.